Ski the Dolomites, skiers nirvana! All details taken care of for you, at one great price! Fly into Venice, take luxury coach scenic 2 hours ride due North to Cortina d’Ampezzo, a quaint city of 5,000 which sits in the valley surrounded by Dolomite Mts. 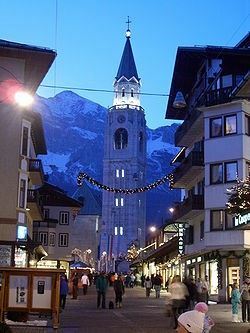 Cortina is the place for the jet-setters & aristocrats but without the attitude! Spend 7 nights in the lovely 5-star spacious Grand Hotel Savoia. 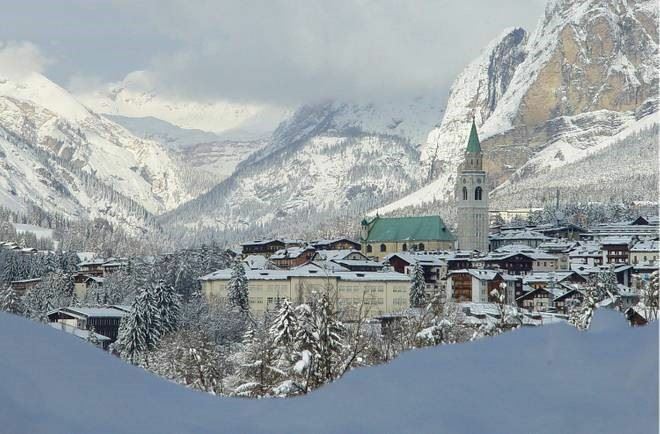 Ski three local areas within short bus ride from hotel, plus an all-day ski experience on the Sella Ronda, one of the world’s most spectacular long-distance unique circular ski routes! Ski thru 4 villages without ever taking your skis off! AND, for the Non-Skiers, there will be day excursions to Innsbruck, Capital City of Austria, hub of activity; Bolzano, home of the Neolithic Mummy, the Iceman; Conegliano, 10th Century Castle ruins, area known for its wine production; and, Udine, home of castles, museums and art galleries. Plus, local shopping & museums with an easy walk. Then Venice for 3 additional nights, staying in 4-star Bonvecchiatti Hotel in the center of it all! History, shopping, hole in the wall restaurants/bars, no roads only canals, Renaissance & Gothic palaces, Piazza San Marco home of St Mark’s Basilica, 391 pedestrian bridges & much more! Includes a guided walking tour. Tour, Party & Ski/Board with other clubs from Florida. All details taken care of for you! Package Price exchange rate $1.25 USD to 1€. CANCELLATION POLICY: All cancellations must be received by Trip Leader for Orlando Ski and Travel Club in writing. No penalty if cancellation is received prior to July 29, 2018; $100.00 per person cancellation fee if cancellation is received after July 29, but before Aug 20th 2018. After Aug 20th, 2018, cancellation will result in forfeiture of the deposit paid or the total cost to the club of such cancellation. No refunds after Dec 15, 2018.